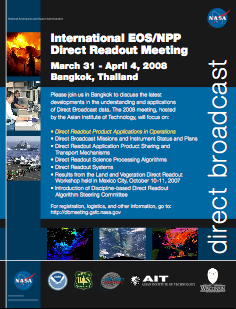 > Download Flyer (PDF) NASA, the Asian Institute of Technology (AIT), the Geo-Informatics and Space Technology Development Agency (GISTDA), the USDA Forest Service, the University of Wisconsin and the NPOESS Integrated Program Office are pleased to announce the next International EOS/NPP Direct Readout Meeting, to be held during the week of March 31st, 2008, in Bangkok, Thailand. Please check this site in the weeks to come as we populate it with additional meeting and logistics information. In the last two years, the Direct Broadcast community has made great strides in obtaining, developing and utilizing science algorithms for real-time and temporal applications. Now we plan to continue this thread and explore the latest application algorithms, systems, and their impact on science, commerce, and decision-making infrastructures. This year our meeting will focus on Direct Readout Product Applications in Operations; Direct Broadcast Missions and Instrument Status and Plans; Direct Readout Application Product Sharing and Transport Mechanisms; Direct Readout Science Processing Algorithms; and Direct Readout Systems. All participants, regardless of their affiliation, should feel free to contribute as much as possible throughout these discussions. We will begin the meeting with status updates on existing satellite missions and instruments. Next we will focus on developments in the Direct Readout application algorithms, science research using Direct Broadcast data, as well as science processing systems. We encourage vendor presentations, recognizing that along with the university community, the commercial sector sets the pace for acquisition and science processing systems, and has indirectly determined how much DB data is used by the public. We will conclude the meeting with updates on continuity missions, such as the NPOESS Preparatory Project (NPP) as a follow-on to EOS and as a pre-cursor to NPOESS. These last discussions will include presentations on continuity science algorithms, their availability, and timelines for implementation. For this meeting, the Asian Institute of Technology in Bangkok will be our hosting organization. AIT has been a strong user of DB data and a developer of Direct Readout science algorithms. I would like to thank AIT for their kind support and leadership in hosting our next meeting. We encourage the maximum sharing of information through lectures, posters, presentations and discussions. We welcome you to a meeting, in beautiful and exciting surroundings, to express what we hope will be the state-of-the-art for the understanding and use of Direct Broadcast data.